Driving through Chatham, don’t be fooled by the modest homes and dive bars in the heart of town. Soon, you’ll hit a part of Chatham you didn’t know existed, no matter how many summers you’ve spent here (in my case, many). Sure, people who summer in Cape Cod are generally well-off, but the town has such a down-to-earth vibe, you’d never guess this little community of mega-mansions existed. But there they are; and the Chatham Bars Inn is right at home among them. The first thing you’ll notice of the “inn” is the wide main building that looks a bit like a plantation—to someone who hasn’t seen many. It has two wings that are angled in, which makes it look as if the building is literally opening its arms to welcome you in. You’ll want to hop out of the car at what looks like a main entrance: a roundabout with a sign for the hotel surrounded by flowers in the middle, in front of a staircase that leads to doors and the covered porch filled with rocking chairs and heat lamps. Don’t. That’s no longer the main entrance. Drive around to the back, where a less picturesque but more convenient parking lot and driveway await to welcome guests. Upon entering the back/front door, an off-white carpet is rolled out for you, leading into the main room of the hotel. As you walk along it, you’ll be drawn to the massive scenic photographs adorning the wall on your left and the gift shop on your right filled with preppy clothing. At the end of that initial hallway, a wood paneled world opens up to you. The left room is where reception sits behind long wooden desks. This is also where you can exit the hotel to get to that other side, where the porch and rocking chairs are. While it’s called the main “inn,” this is not your typical mildew smelling inn with limited space and mismatched furniture. Dark wooden beams cut across the low white ceiling creating a crisp yet cozy frame for the large space. The furniture and rugs are light atop a darker wooden floor, continuing that same juxtaposition. So as not to veer too glam, lanterns hang from the ceiling instead of chandeliers, and a carpeted wooden staircase sits next to reception. Two of the hotel’s restaurants are tucked into this room’s corners (one of which houses an original Normal Rockwell painting). It’s impressive and powerful, but the room you really want to check out before exiting this building is the South Lounge, which is on the other side of the hallway you walked in through. It’s a bit of a 180 from the lobby, literally and figuratively. It’s cleaner, with white pillars and limited wooden accents. It’s also filled with antique tchotchkes like globes and musical instruments. But some consistencies remain, like the lanterns. The floor to ceiling windows let natural light in but the fireplace against the back wall keeps it cozy and warm. Pick a spot at a table by the windows and try your hand at one of their vintage board game sets, or browse the library set off this room. Plaid pastel curtains remind you that you’re in Cape Cod, not some British tea room. If you need a break from this posh version of Cape Cod and are craving a little New England brusqueness, you don’t have to journey to Main Street. The hotel stays true to its roots with a pocket of New England charm in the Sacred Cod, just off the main lobby. This restaurant is more like the dive bars you’ll find all over the Cape in its dim yet drunken, laidback vibes. There are 40 guest rooms throughout the main inn’s three floors. The grand staircase by reception will take you to them. The rest of the 217 rooms are in one of the bunches of cottages dotting the establishment’s 25 acres. Each of these sections is like a really nice end of a cul-de-sac. There are private homes breaking up the property, and they all kind of blend together—so much so that the private homes are labeled, that way you don’t wander up to some stranger’s door in the dark after some cocktails at the Sacred Cod. With its grid layout and street signs, the property is much like a gated community, allowing you to truly feel like you’re home (unless this is way better than your home, as is the case for me) after just a night at the resort. Their shingled cottages are situated along CBI’s quarter-mile-long private beach, and luckily, most of the cottage rooms have a private deck or patio stashed with Adirondack chairs. Within the cottages, the accommodations range from single rooms to deluxe suites, but they are all alike in design. The color scheme is white with lots of light greens and browns, and they feature and hardwood floors with some rugs. The furniture is hand-painted or upholstered in Cape Cod-style patterns (read: checkered and fish). Many have bay windows and window seats that act as dining nooks, and others have gas fireplaces for the colder Cape nights. The rooms in the main inn have a similar style, yet start smaller. In the cottages, standard rooms come with a king or two queen beds, while standard rooms in the main inn are furnished with a queen-size bed. If you like the lower rate but want outdoor space, half of the rooms in the main inn have balconies. Don’t worry: you’ll get robes and luxurious L’Occitane amenities no matter where you choose to stay. Spa suites are also available for guests with pampering priorities. These 12 rooms are much more modern, with an oversized hydrotherapy tub, a sauna, a steam shower, a built-in massage table and a fireplace. In its $100 million renovation, it’s clear the priority was to turn this 100-year-old property into a community more than a resort. 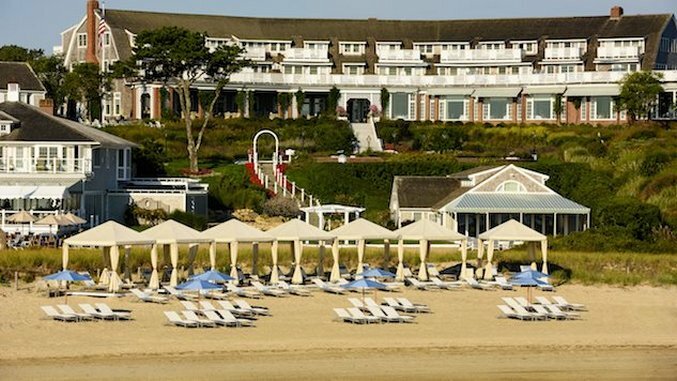 Yet, the New England getaway aspect is also ever-present in its nine-hole golf course, three tennis courts, outdoor heated pool and Jacuzzi (in addition to a pool at the spa) and nightly summer clambakes at their Beach House restaurant. While I was immensely impressed by the balance between home and away, I was more moved by CBI’s charitable efforts. Casually over breakfast one morning, the manager told us they work with an organization called Cape Abilities to recruit and hire people on the spectrum for resort jobs. CBI also donates flowers to nursing homes, provides the use of cottages to nonprofits for fundraisers, donates money for children who need school supplies, organizes a food pantry and hosts free Thanksgiving dinners for locals. They do all this while maintaining their Triple Crown status—meaning they have a four star resort, spa and restaurant. The hotel is located on a bay in the Atlantic Ocean. It’s half a mile from the heart of town—which turns into a 10-minute drive.